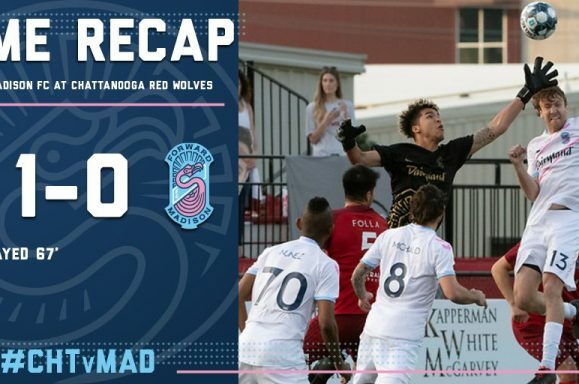 Forward Madison FC had to wait, but the Flamingos finally kicked off their inaugural USL League One season Saturday night on the road in Chattanooga, TN against the Chattanooga Red Wolves SC. The Flamingos opened in a 4-3-3 formation, with four Minnesota United FC loanees in the starting lineup. 2019 SuperDraft pick Dayne St. Clair started in goal. Wyatt Omsberg and Carter Manley were joined in the backline by veterans Don Smart and Connor Tobin. Mason Toye lead a trio of attackers, joined by Paulo Júnior and Jiro Barriga Toyama. Forward Madison’s first match began with the team on the backfoot, conceding possession to the Red Wolves during the opening minutes of the match. Despite the lack of possession, the Flamingos did not allow the hosts any dangerous chances on Dane St. Claire’s goal. After weathering the initial possession spell, the Flamingos produced the first shot on target of the game. Carter Manley sent a ball into space down the left for Mason Toye to run onto. Toye did not get enough on his chip from a tight angle; and Red Wolves keeper Alex Mangels easily corralled the effort. Just two minutes later, Toye again made his presence felt, as the on-loan attacker won a free kick in a dangerous area, just outside the top of the 18-yard box. The resulting attempt on goal by Josiel Nuñez did not dip in time and sailed over the bar. Forward Madison continued to apply the pressure, with the team maintaining possession, winning corners and drawing fouls. However, the team could not capitalize on any of their opportunities. Forward Paulo Júnior had two attempts saved during this spell of pressure. As the half drew to a close, Chattanooga began to regain some momentum.The Red Wolves ended the half with a series of free kicks in the attacking half. Like the Flamingos, however, the Red Wolves could not capitalize on these opportunities, and the half came to a close with the scoreline level at 0-0. The second half began much like the first, with Chattanooga dominating possession in the opening minutes. After this initial spell, the Flamingos played themselves into the half and controlled the ball for large portions of the first twenty minutes of the half. Neither team produced much, however, and dangerous chances were absent as the minutes drifted by. This rather lackluster opening to the second half was broken in the 67’ with a goal from Chattanooga forward Éamon Zayed, who controlled a long ball, muscled off the defender and beat St. Clair with a right-footed shot into the left-side netting. One-zero Red Wolves. Forward Madison had a chance at an immediate response, but could not convert on a 69’ corner. Neither could the team convert on the number of chances they created while chasing the game during the final 20 minutes. The Flamingos brought on attackers Zaire Bartley and Brandon Eaton, but neither made much of an impact on the proceedings, nor did late-game sub Brian Bement. Chattanooga had chances of their own to double their lead, but the hosts were unable to convert. 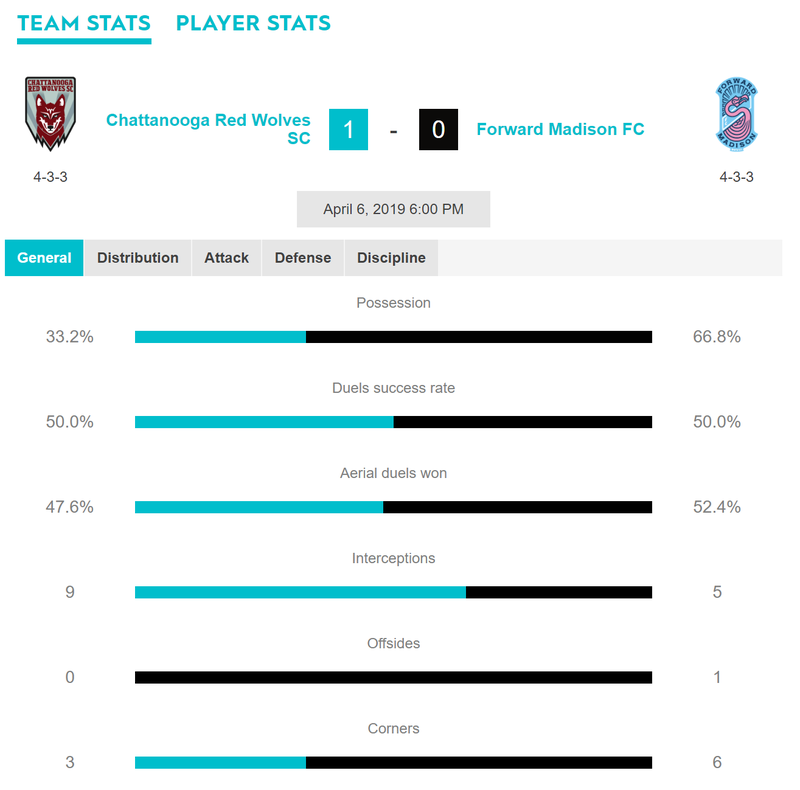 As a result, Forward Madison FC fell to the Chattanooga Red Wolves SC 1-0 in their inaugural USL League One game. The Flamingos’ (0-1-0, 0 points) next match is another away game against North Texas SC on Saturday, April 13, with kick-off scheduled for 9:20 p.m. CT.
Head coach Daryl Shore has stated that he prefers his full backs to contribute in the attack, and Manley did so quite well in his first official match for the Flamingos. His 3 key passes created a series of quality scoring chances. On the other side of the ball, Manley, although he did concede a free kick in a dangerous area in the first half, was active and capable in his defensive duties. Omsberg was a steady presence in the center of the Flamingo’s defense, a unit that only allowed one shot on target. Unfortunately, that one shot found the back of the net. Toye had a positive start to the game. He was a nuisance up front and troubled the Red Wolves’ defense on a number of occasions throughout the first half. His 10th-minute shot, after receiving a great ball down the left from Manley, was the first real chance of the game. Toye’s second half was less impactful, as the forward drifted in and out of the action. St. Clair had a quiet night. The only real meaningful action, unfortunately, was pulling the ball out of his net on the Red Wolves’ only shot on target. The rookie goalkeeper had no saves, punches or catches.